Surprisingly, I've never hated Christmas music and I've always felt the more the merrier. That said, everyone must understand, there's only one Christmas album that matters. To my ears, all other Christmas albums sound like third-rate Chipmunks knock-offs, and that includes the impervious Bing Crosby! When all the skulls and odes to Satan are quietly put away for another year, the dreaded ramp-up to Christmas begins. In the States there's still Thanksgiving and Black Friday to contend with to keep the Yuletide at bay, but up here in Canada it mushrooms overnight. In the blink of an eye gone are the pumpkins and witch's wands and in come the stockings and pine trees. It's enough to make even the most staunch Christmas carolers feign laryngitis. We're all more than aware that the good intentions behind Christmas died long ago. When Ebenezer Scrooge was supposedly converted by The Ghosts of Christmas, Dickens failed to give us the final chapter of the story where Scrooge discovered that maintaining a jolly, disingenuous disposition is monetarily better for business and can yield greater dividends that'll tide you over during the slower months like January and February. For a lot of people, besides the inevitable last-minute shopping, black ice, -30 degree weather, unending darkness and general malaise, Christmas music contains just of that special grating something to make people wanna commit holiday harakiri. The last thing we need to hear is some overly-peppy voice thankful for all the goddamn snow while we watch our savings dwindle in order to please some bratty nephew. Most people rightfully knee-jerk into a hateful diatribe about Christmas music. Still, it never stops anyone from buying more Christmas records every season with the newest crop of celebutards taking a stab at it each year from the cast of Glee to Lady Antebellum. Of course, there's always the ironic hipster twisters who always assume their job is to take something unhip and turn it cool like some Pitchfork Martha Stewarts. Zooey Deschanel's She & Him Christmas album A Very She & Him Christmas, Bright Eyes' A Christmas Album and even Scott Weiland's The Most Wonderful Time Of The Year all come to mind. All of this is fine by me. 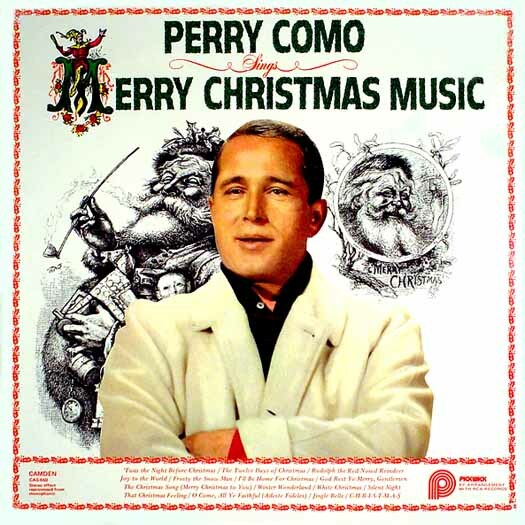 No, the only Christmas album that everyone should have, if they intend to go through the vacuous pantomime of embodying Christmas spirit is Perry Como's Perry Como Sings Merry Christmas Music. The album is a compilation Como's 1946 and 1953 Christmas Carol sessions. It's all you need. Trying to wade through the RCA/Victor reissues, remasters and repackages of Como's output is more proof that the music industry of old remained afloat by being the ultimate Encyclopedia salesmen. No, the 15 tracks contained on Perry Como Sings Merry Christmas Music, released in 1956, regardless of any refashioned Como Christmas release, remains the zenith of Christmas music. 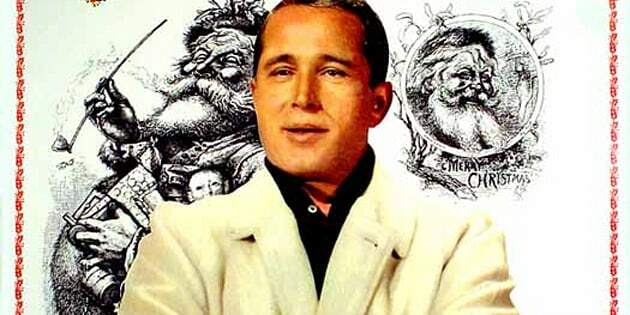 Sure, Bing Crosby's Merry Christmas album is largely seen as the blueprint for the genre itself, with "White Christmas" being the biggest single ever in the history of recorded music, but after one listen to Perry Como soothingly sing it, Crosby's signature baritone voice suddenly sounds like Jabba The Hut or Chris Barnes from Six Feet Under decided to drop in for eggnog. Listening to Bing Crosby sing "Joy To The World" is like listening to someone getting a colonoscopy, while Como's rendition sounds like how baby powder, scented candles and potpourri smell. After I listened to Perry Como sing "God Rest Ye Merry, Gentlemen," Crosby's version instantly became about as flaccid as one gets watching a stripper take her clothes off to Gregorian chants. Como's style, famously lampooned by Eugene Levy performing bedridden on SCTV, is the equivalent to taking a sedative. His voice is a sultry tranquilizer that's meant to take the edge off Christmas anxiety. For me though, few records elicit such a positive Pavlovian response. When the time came to play that Como record back when I was a kid I knew that presents were on their way. Today, I'm older, and arguably wiser, but I still know Como's voice will get me something, only now I just log on to eBay and buy it myself.